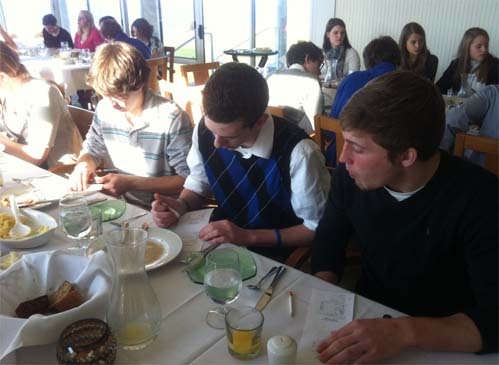 Onekama Seniors enjoyed brunch at Arcadia Bluffs as a culmination of their etiquette course. Author Bill Kelly wrote, “Good manners are a way of showing other people that we have respect for them.” The Senior class of Onekama High School recently had the opportunity to put Kelly’s words into action. The students participated in a four-session etiquette class designed to help them better navigate the world outside their classroom. The course, taught by former Onekama teacher, principal, and superintendent Beth McCarthy, covered topics including first impressions, gracious guest practices, communication techniques, social awareness, and appropriate manners in daily living. Other subjects addressed during the sessions included the art of the "thank you" (through word, written notes, hostess gifts, etc. ), interviewing skills, and confidence building exercises. On November 21, the etiquette classes culminated in a distinctive practicum: a fine dining experience at the restaurant at Arcadia Bluffs. 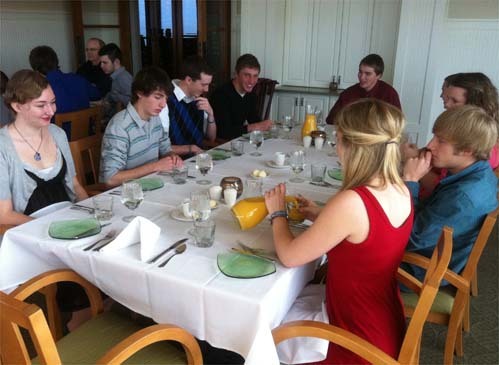 The 33 students, along with McCarthy and Senior class advisor Dana Woolman, were treated to a complimentary meal at Arcadia Bluffs, thanks to Bill Shriver, Chief Operating Officer, and Scott VerStrat, Director of Food and Beverage. “The brunch setting gave the students a fine dining experience with opportunities to become familiar with appropriate attire, gratuities, seating, ordering, table conversation -- all while having a good time,” said McCarthy. the tip on a mock dinner tab.